Aerating is the act of perforating the soil with small holes to reduce compacted soil. This will improve air circulation as well as water and fertilizer intake that leads to a healthier lawn. 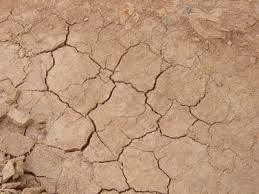 What causes the soil to become compacted? Usually a lawn that has heavy traffic on it, such as dogs and/or children playing, a riding lawn mower, etc. the ground can become very compacted. A thatch build up can also cause the soil to compact. If there is a thatch build up you need to remove it before aerating the lawn. Also the lawns of new homes or lawns that have been sodded can have compacted soil. Your lawn needs to be moist when aerating. The day following a nice rain provides excellent soil conditions for aerating your lawn. 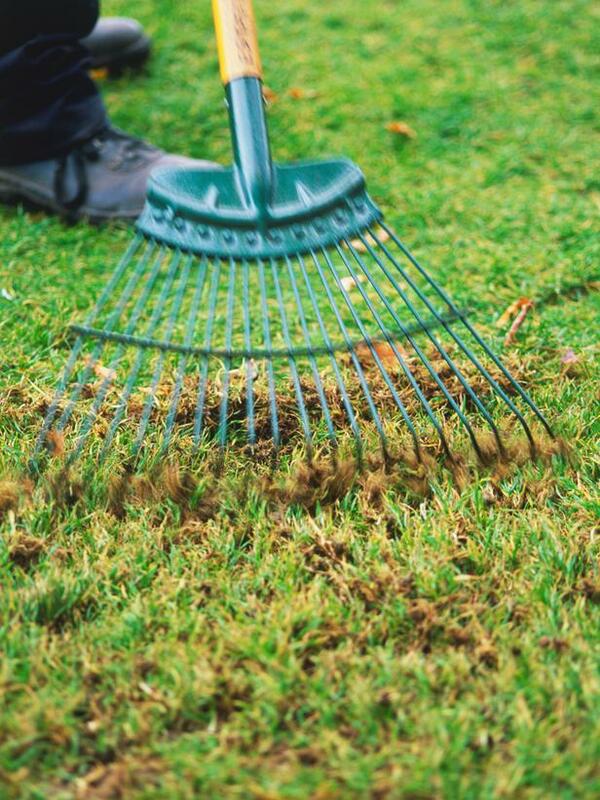 Fall or spring is the best time to aerate since your soil is soft and moist then. Aerating is done with either a spike aerator or a plug aerator. The spike aerator pokes small holes in your soil, helping to break up the compacted soil. 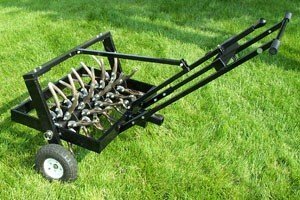 The plug aerator is more effective since it makes the holes about ½ to ¾ of an inch wide and goes deeper into the ground extracting a core of soil. This will break the compacted soil more than a hole made by the spike. If the plugs do not breakdown by themselves after a couple of rain showers, you can break the plugs down using the back of a rake or even running your lawn mower over your grass. After aerating, continue to use and care for your lawn as normal. Have you ever noticed the dead plant material like leaves and stems that builds up between the soil and the living grass? That is Thatch! Thatch is a natural process and is necessary to help protect the roots, however excessive thatch prevents moisture, oxygen and nutrients from penetrating the soil. Allowing the thatch to build up can result in an unhealthy lawn. Thatch also increases the chance of problems with pest, fungus and lawn diseases. If your lawn has less than ½ inch of thatch it is fine. If you have a layer of thatch ½ of an inch or more then its time to de-thatch. To remove a build up of thatch there are a few approaches you can take. You can do the dreaded vigorously raking in two directions. Or, to make the job a little easier you can use a de-thatching machine. The easiest way to get rid of thatch is by using a water soluble thatch remover, such as our “Liquid Thatch Remover” product. Just attach the container to your garden hose and spray your lawn. 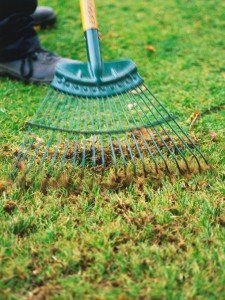 Using a rake or a de-thatching machine can be hard on the turf, so you only want to de-thatch when the grass is actively growing and has time to recover before the winter weather. Early spring, after the grass has greened up, is good time to de-thatch a lawn. Do not de-thatch your lawn when it is in a dormant state, this can damage your lawn. Whether you use a rotary or reel mower, the key step in proper mowing is to make sure your mower blade is sharp. If you use a dull blade this will just rip the grass and not cut it. Your mower blade should be sharpened about every 8 mows or once per year. If the grass is not properly cut it can lead to the tips turning yellow the day after mowing. The recommend height for zoysia grass is around 2 inches. You should never remove more than 1/3 of the blade. What that means is if you maintain your zoysia lawn at 2 inches once the grass reaches 3 inches it is time to mow, you only want to remove 1 inch of the blade. You can measure the mowing height by setting the mower on a flat surface, making sure all four wheels are at the same setting. Then measure the distance between the ground and blade. It is advisable to change the mowing direction. If you’ve mowed in horizontal lines a few times, change it up and mow in a vertical pattern. Switching directions with each mow will help your lawn to avoid a build up of thatch and stay healthy and beautiful! 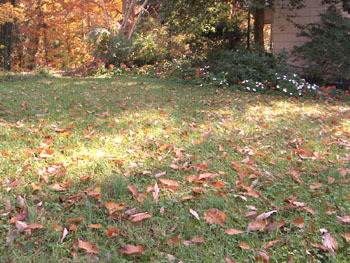 With spring at our heels, it is time to start preparing our lawns for the summer months ahead. Spring maintenance will help you to have a beautiful, healthy, green lawn this year. 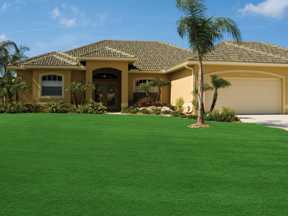 To get started it is best to de-thatch your lawn, once it has greened up. It is helpful to remove dead leaves and thatch material resulting from the previous season’s growth to improve the passage of air, water, and nutrients through the turf. The easiest method to de-thatch your lawn is by using a Liquid Thatch Remover. This is a product we offer that is a natural liquid microbial treatment. Four treatments during the growing season will keep your lawn thatch free. Simply attached the 32 oz hose end sprayer to your hose and spray. It’s that easy! After de-thatching your lawn applying a pre-emergent will help rid your lawn of weed and crabgrass seeds before they have a chance to germinate. Our Gluten–8 Organic Herbicide is the ideal product for this. 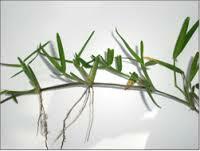 Gluten 8 is simple and easy to use it’s very effective in reducing new weeds from ever starting. Do it early. Do it more than once. This is also a great time to test the soil pH in your lawn. For the best results from your zoysia lawn we recommend the soil pH be between 6 and 7. If the soil pH is below a 6 then you should apply some lime, if the pH is above a 7 you should apply sulfur. Please follow the label instructions for the proper application. At our website you will find a soil pH Meter and a Rapitest soil kit as well as our Café Lime if your lawn needs lime. Sulfur products are best purchased from your local Garden Center. Aerating your lawn, which is great for your grass, is also best done in spring to help loosen the soil and improve air flow and root growth. You can rent portable power aerating machines or most lawn care companies offer this service. The grass is green, the trees are full, the flowers are blooming. Unfortunately, the lawn and garden pests are also making their appearance. I don’t know which pests can annoy one the most, the insects or the small mammals in the lawn. Those pesky little animals like moles, voles, armadillos, etc. that dig or burrow can cause some real damage to your lawn. These varmints can be a real challenge to get rid of. At one time the only way to get rid of these pests was to trap and relocate them. There are now some products that can be used to help rid your lawn of those pests. You can visit our website at www.zoysiafarms.com for two natural products that we offer, Armadillo Repellent and Mole & Vole Repellent. Both of these you simply attach to your hose and apply. This pest will relocate themselves back to where they came from! Amazoy zoysia grass is not a preferred habitat for many insects, because of its very dense growth pattern. For the insects you do have to deal with, whether they are ants, fleas, ticks, chinch bugs, etc. a good pesticide should be applied. With so many chemicals being applied to lawns these days, you may want to use an organic pesticide like our Essential-1 Organic Pesticide. All of these products are safer for your children, pets and environment. Just attach it to your hose and spray, the contents will mix with the water at the correct rate and you’ll be done in no time.